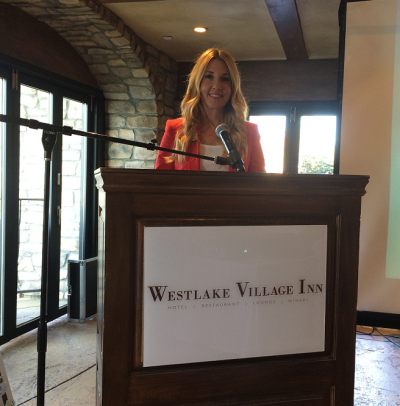 On Thursday May 12th, Manchester Financial hosted their second Women in Transition Panel and Reception at the Westlake Village Inn. Marketing Director at Manchester Financial, Nancy Angle, organized and emceed this popular event. 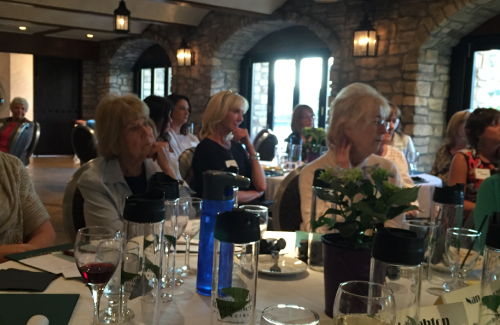 The attendees enjoyed delicious food and wine in the beautiful setting of the Wine Cellar Room at the local hotel. Jennifer Leighton, Senior Analyst at Manchester Financial, created the lecture series to better equip and support women as they navigate life’s transitions. From the divorced to the widowed, from the new mom re-entering the workforce to the retiree, Manchester Financial strives to give women the tools they need to create financial health. Emphasizing a holistic approach to finances, Jennifer crafted a diverse speaker panel including Alexandra Guzman, a Licensed Marriage and Family Therapist, Elana Foxx, a Brokerage Director at BackNine Insurance Services, and Esther Hopkins, an estate attorney at Hilliard Hopkins. Jennifer also spoke, sharing her tips on saving, the importance of financial planning, and her own experiences with life’s transitions. “The Women in Transition series was created to fill a lack of financial resources geared toward women and to provide a place to educate and empower them. Manchester Financial is passionate about helping women achieve their financial goals and we see these events as a way to facilitate this,” says Jennifer. For more information and any questions, please email jennifer.leighton@manchesterfinancial.com. Susannah Beard is an Operations Assistant with Manchester Financial, an Investment Counsel/Wealth Management firm located in Westlake Village. For more information call 800-492-1107. This entry was posted in Events, Women in Transition. Bookmark the permalink.